You can filter the Files in every explorer view of Filemanager Q-Dir! In fact, Q-Dir has an effective file filter. Activate it with the filter button, then enter the filter option, as the text, e.g. *.exe. Multiple filter is also possible, for example: "*. txt;*. 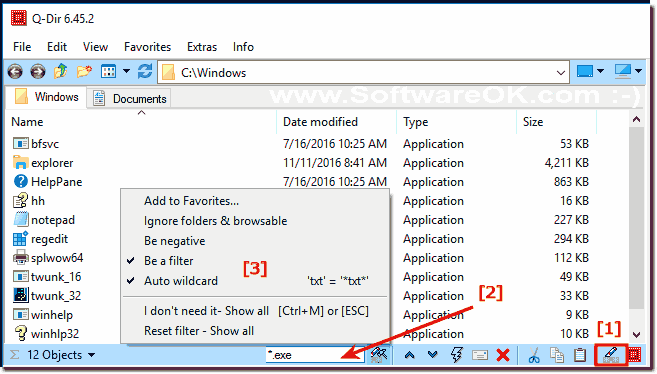 doc"
You can select or filter files and folders. Be negative: e.g. when everything should be filtered that not ends whit "*.txt". Directories or folders will be ignored at each filter setting. Of course the filter options can be saved as favorites to save time and hand grips. Q-DIR - FAQ-38: How can i filter the Files in Explorer Views in Quad-Dir? Can a file filter be added to Q-Dir? Thanks. I would like to exclude the following files from the various Q-Dir windows: *.ini2, *.ptn, *.ppinfocache, maxdesk. * Reading the filter tab under "more options", its not clear what syntax I use for this.Can you give me a syntax example?